I read this today and found it such an awesome story so I want to share and also archive it here for keeps. I dont think I have ever heard of or read any stories of Black Americans being heroes back in the 1800's so I found this very interesting. 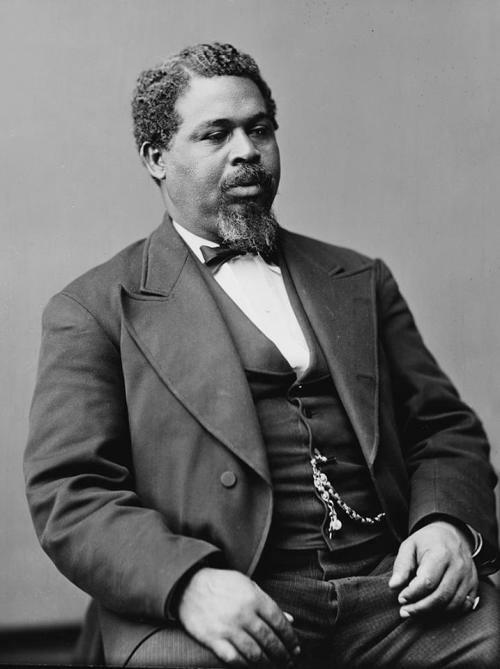 Robert Smalls was born into slavery on a South Carolina plantation. As a youth, he was permitted to go to Charleston and work, though he was forced to send most of his wages back to his master. He began taking jobs at the docks in Charleston Harbor, and later on some of the ships that came and went from the port. By the time the Civil War came around, Smalls had become an experienced seaman, so he was assigned to steer a Confederate Navy vessel called the Planter, based out of Charleston. The crew consisted of a few white officers and a number of slaves. Smalls went to great lengths to show the Confederates that he was trustworthy and content, they never knew that he was hatching an elaborate plan to escape from slavery and deal a blow to the Confederacy, and that he had secretly recruited most of the enslaved crew in his plot. So one night, when the Planter had docked in Charleston with a shipment of heavy guns aboard, Smalls put his plan into action. When the officers went ashore for the evening and left the ship in the care of the enslaved crew, Smalls led them in hijacking the vessel. They made one stop at another set of docks to pick up the families of Smalls and other crew members, who waited in hiding after having been notified of the scheme in advance. They weren't in the clear yet though, because they still had to sail past a number of Confederate checkpoints on their way to freedom. But Smalls had a plan for that too. He had been watching the captain and learning the hand signals he used at the checkpoints. Donning the captain's uniform and trademark straw hat, he guided the Planter past five Confederate harbor forts by impersonating the captain and displaying the correct signals. By the time anyone realized the Planter had gone missing, it was too far gone to catch. He had his crew replace the Confederate flags aboard the ship with white ones, and they were intercepted by a Union vessel who saw the white flags just before they were about to fire. The Union sailors were perplexed by the sight of an all-black crew, until Robert Smalls came forward and shouted, "Good morning, sir! I've brought you some of the old United States guns, sir!" He then asked the Union sailors to give him a United States flag to raise on the Planter. Robert Smalls' story would be amazing if it ended there, but it doesn't. After receiving a large sum of prize money for his delivery, he entered service in the Union Navy as a pilot on several vessels, including the re-purposed Planter. In this role, he removed mines that he had helped lay as a slave, and participated in a number of sea battles. During one battle, the fighting grew so intense that the captain of the Planter hid in the interior of the ship and ordered the crew to surrender. Fearing that the black crewmen would be enslaved or killed if captured, Smalls refused to surrender. Instead he took command of the ship and navigated the Planter through the Confederate onslaught to safety. Because of his bravery, Smalls was promoted to captain himself, becoming one of the highest ranking and highest paid black officers in the Civil War. Smalls leveraged his resulting fame into social activism, throwing his support into an initiative to educate former slaves, and becoming literate himself (in most Confederate states, it was illegal to teach a black person to read). While riding a streetcar in Philadelphia, he was ordered to give up his seat to a white passenger. Smalls left the car rather than suffer the indignity of being forced to ride on the overflow platform. When word got out that a decorated hero of the Civil War had been humiliated thusly, it prompted a backlash that led to the integration of public transportation in Pennsylvania. But Robert Smalls STILL wasn't finished. He entered politics, serving in the South Carolina legislature before becoming one of the first black people elected to the U.S. House of Representatives in 1874. And he remained active in public life into the 20th century. In 1913, he prevented the lynching of two black men accused of murder in his town by warning the mayor that the local black population would burn the city to the ground if the mob was not stopped. And the plantation where Smalls had grown up a slave? He purchased it after the war, and lived there until his death in 1915. The monument at his grave is inscribed with this quote: "My race needs no special defense, for the past history of them in this country proves them to be the equal of any people anywhere. All they need is an equal chance in the battle of life." And that is the story of the great American hero Robert Smalls, known by too few people today. Thanks for sharing this. I hate to admit it, but i had never heard of him before. I am sure there sre a lot of Black heros that never get mentioned in school, nor appear in the history books. It is time more of this information came into public view. I didnt know Blacks would be considered heroes in that era so this was quite a revelation. Well, I suspect he was considered a traitor by the whites in his hometown area...heros are relative to the envirnment and the time. He was a hero for the Black community and those of the white community that were anti-slavery. no, the whites considered him a hero too. They allowed him to join the Union Navy and he became one of the highest ranking and highest paid black officers in the Union Navy. I thought that would only be reserved for whites at that time. He was also one of the first to be elected into the US House of Representatives and I thought that would have also been for whites only back then. Likely part of Reconstruction. For about 20 years or so, Blacks were very high ranking in some southern states because so many of the Whites were being punished because of their rebellion. yup, I really dont think things got very much better for blacks throughout most of the 18th and 19th centuries after the end of slavery. That's why it is so awesome to read historic accounts such as this one and this is Black History month I just found out so I hope to see other stories like this one. Nice. I can't say that I have heard of him before. Frederick Douglass' autobiography is a great read from that era. Now I have to look for something about/by Smalls. I just remembered I'm supposed to be mentioning of giving credit to the owner/writer of the article. I found it on facebook but I cant remember and couldnt find the post again. I like stories from that era so will check out Frederick Douglass' autobiography..thanks for that. Josiah Henson escaped to Canada and helped establish the underground railroad. Read his biograpgy by Jared Brock. This was quite interesting. I love History and thanks so much for sharing this. Thanks Wendi, I do love history as well.